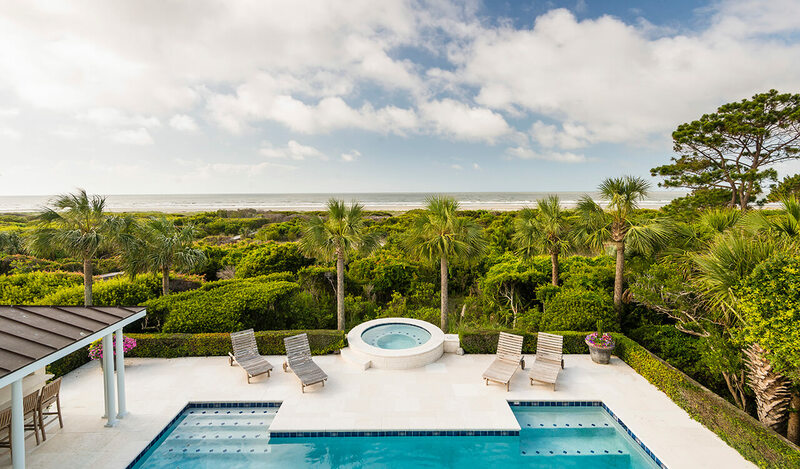 The three-story seaside estate at 128 Flyway Drive, one of Kiawah Island’s most desirable addresses, celebrates its breathtaking views of the Atlantic with 4,250 square feet of outdoor living spaces, from wide covered porches to a heated saltwater pool and cabana overlooking the beach—accessed via an ipe boardwalk shared with a single neighbor. 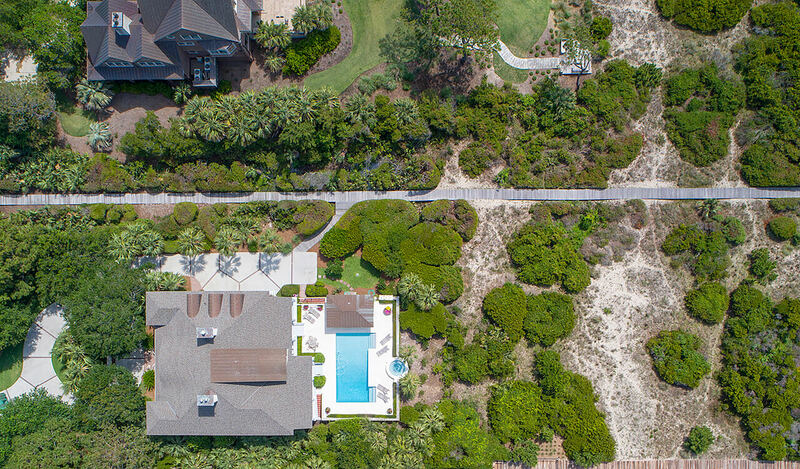 Designed by architect Mitch LaPlante, known for his respect of nature, and surrounded by striking, low-maintenance landscaping filled with palmettos, magnolias, crepe myrtle trees, and perennials by Sunnyside Farms, the home was constructed by Live Oak Construction with meticulous attention to detail. 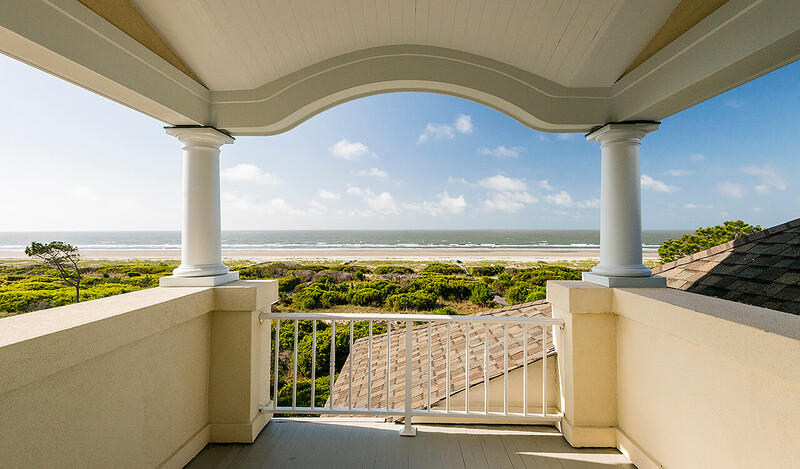 Fine finishes include gracious crown moldings, casings, and baseboards throughout the home, interior doors seven feet in height with Rocky Mountain hardware, custom built-ins of cherry wood, generously sized windows framing incredible water views, and Brazilian cherry hardwood floors throughout the first- and second-floor living areas. 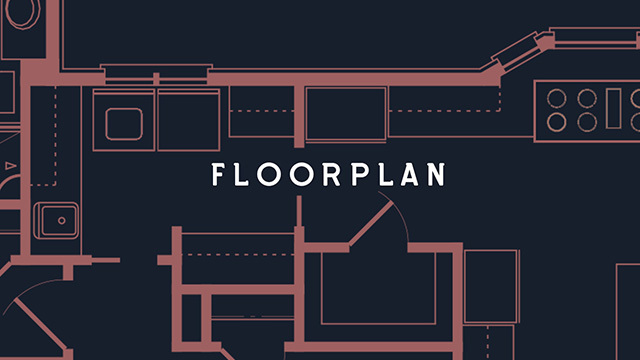 First-floor ceilings soar 12 feet or higher. 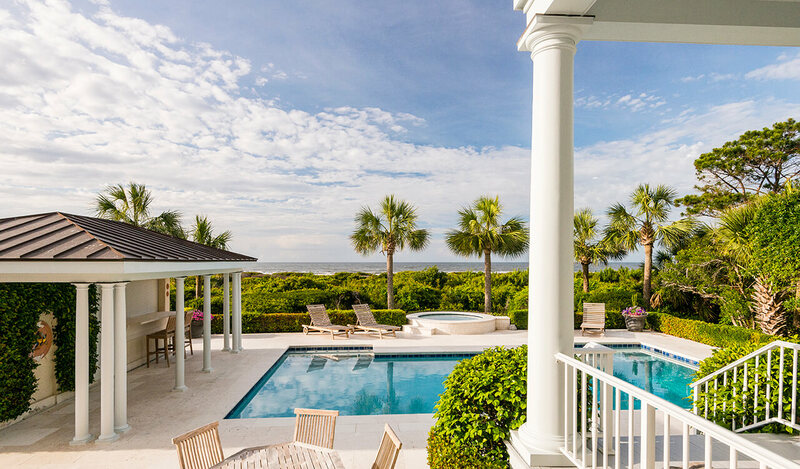 The southern orientation of the property offers the perfect setup for sunshine, moonlight, and sea breezes—and its generously sized living spaces and seven bedrooms accommodate intimate family gatherings and large parties with equal ease. 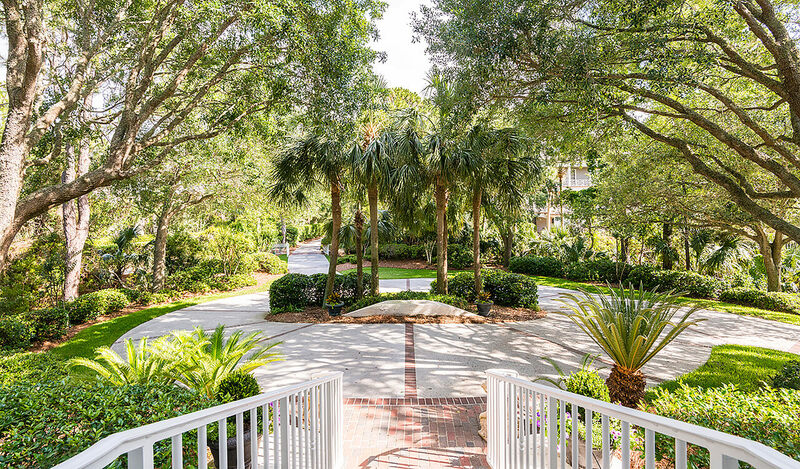 A long, private driveway leads to a circular drive with a separate garage entry to the side. 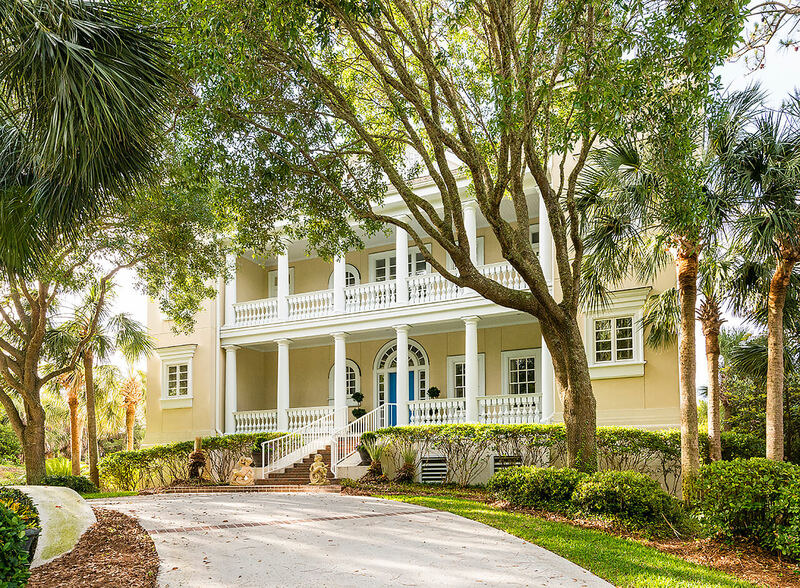 A beautiful live oak is the centerpiece of the motor court, framing the home’s brick staircase and gracious cream-colored exterior with stately columns. 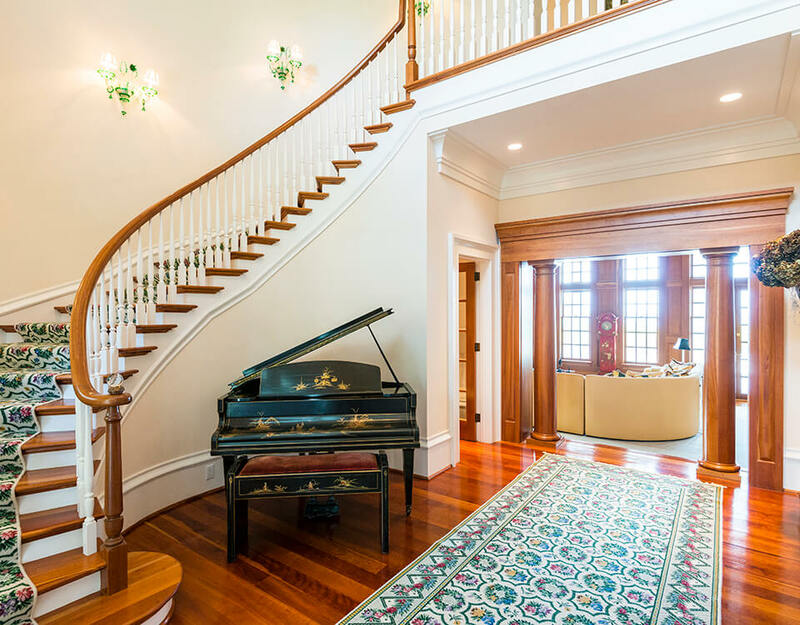 Inside, the graceful Southern foyer welcomes visitors with a Murano® glass chandelier and wall sconces, curved Brazilian cherry staircase with custom carpet runner and mahogany handrail, custom curved molding, and cherry wood columns framing the great room entrance. 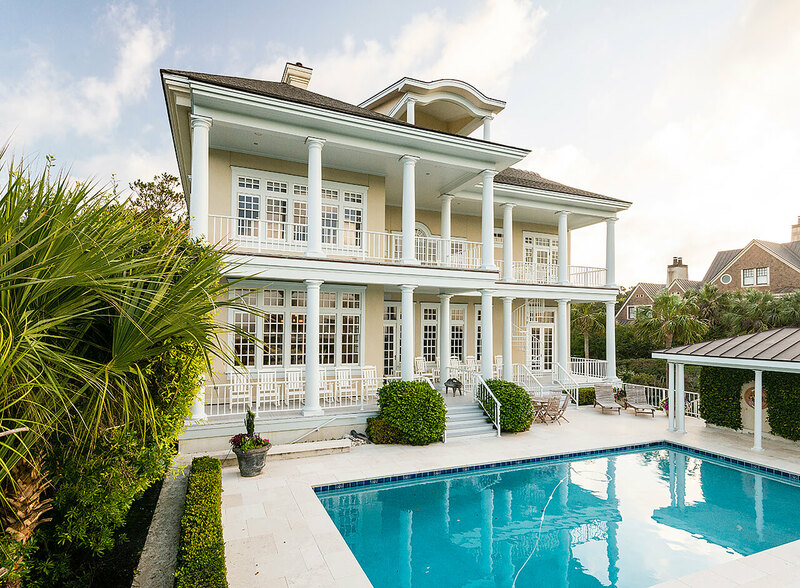 To the right is a dining room reminiscent of historic Southern estates, entered via a set of cherry-wood beveled-glass doors with European locking system, gas fireplace with marble surround, tall windows, and padded silk wall coverings. 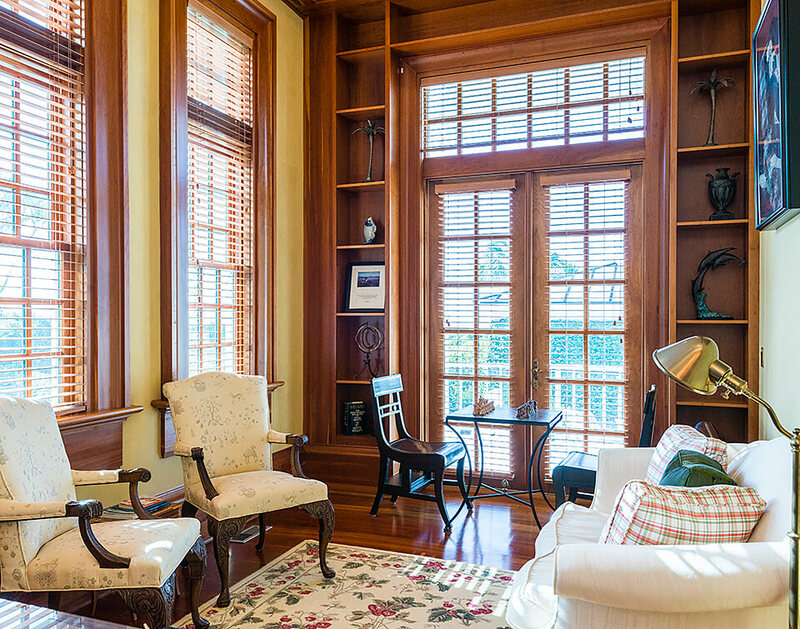 Here the wide crown molding is especially impressive. 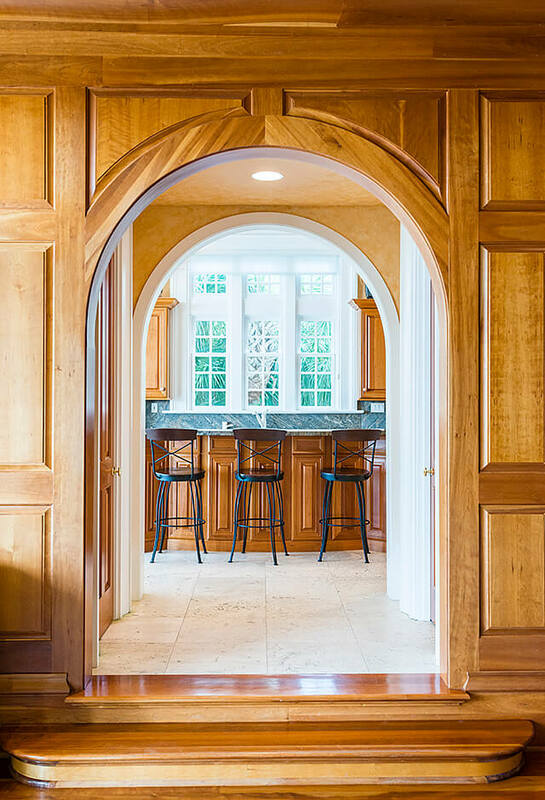 A doorway on the opposite side of the dining room leads to the butler’s pantry, with Sub-Zero® wine cooler, glass-fronted upper cabinetry, and lower cabinetry customized for tall liquor bottle storage—and a gourmet kitchen. Sunny, spacious, and filled with chef’s extras, the kitchen’s professional-grade appliances include a separate paneled Sub-Zero refrigerator and freezer, Thermador® double oven and microwave, five-burner GE® gas cooktop with downdraft, Bosch® dishwasher and custom-paneled Maytag® dishwasher, KitchenAid® disposal in the double sink, and a separate prep sink in the generously sized island with bar seating. The limestone flooring is cool underfoot, and the granite countertops and cherry cabinetry with under-cabinet lighting offer abundant storage and prep space. There’s a large pantry with shelving and a custom built-in desk for perusing recipes. 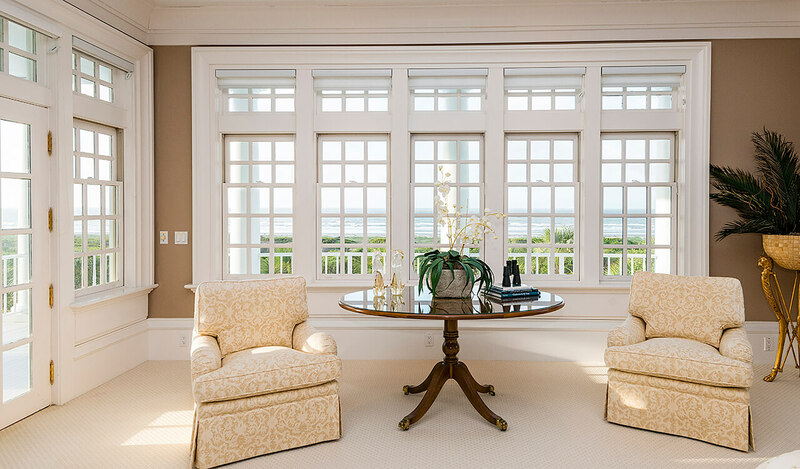 New Marvin® windows with transoms along the western wall stream with natural light. The kitchen is open to both the breakfast nook and living room. 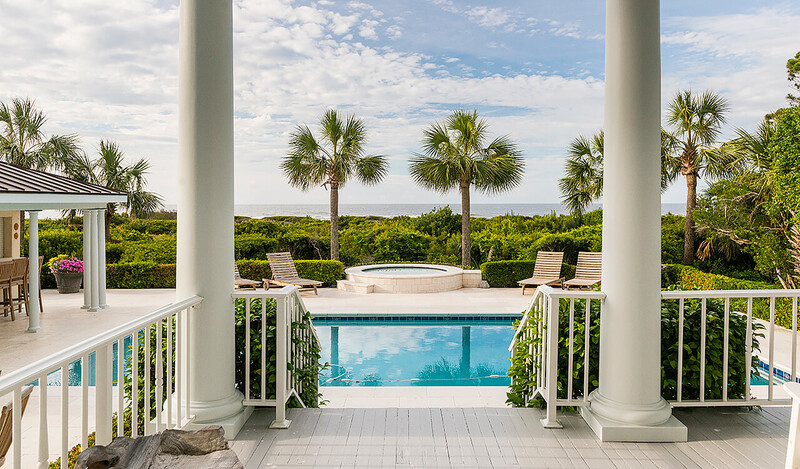 The breakfast room, complete with a curved brick fireplace with raised hearth, overlooks the ocean; a glass door leads to the covered porch beside the pool. 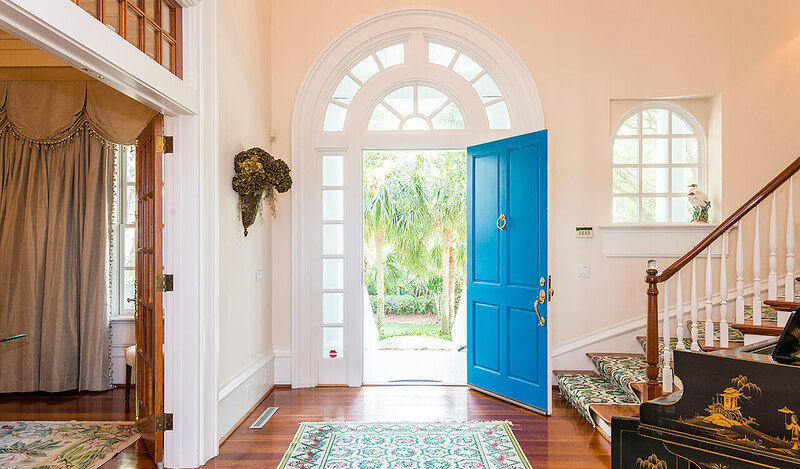 Pass under the large arched opening and past one of the home’s two half baths into the sophisticated wood-paneled living room. 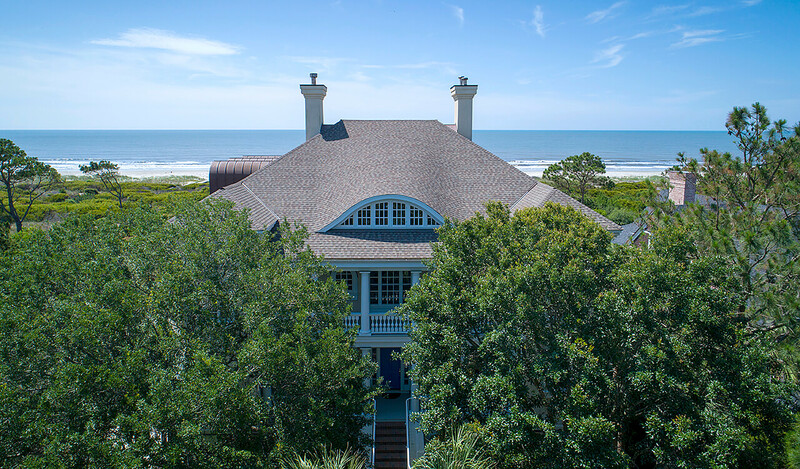 Its cherry-wood coffered ceilings soar 13 feet above, and a wall of tall windows frame views of the Atlantic Ocean. A gas fireplace with marble surround, artwork lighting, custom built-in bar with glass-fronted upper cabinetry and thick stone countertop, and custom built-in multimedia center offer comfort and convenience. 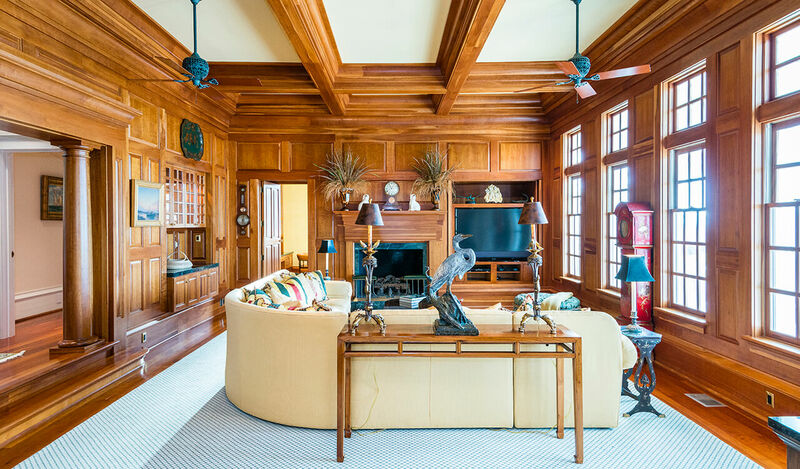 A door nine feet in height, flanked by sculpture niches, leads to another striking feature of the home: the high-ceilinged study. 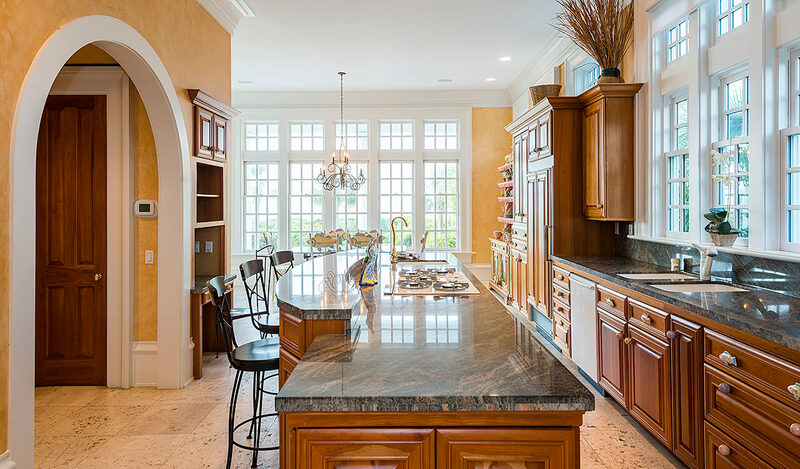 One wall is filled with built-in cherry wood cabinetry with a granite countertop; the opposite wall features built-in custom shelving and tall, transomed French doors leading onto the back covered porch. Another wall is filled with windows eight feet in height. 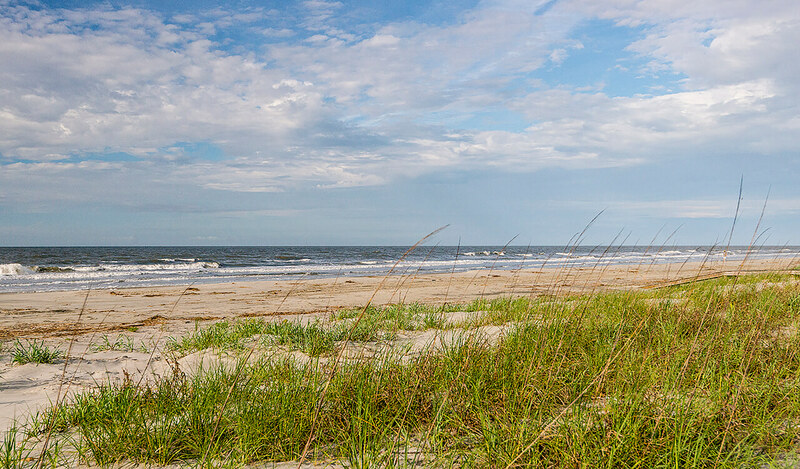 Also on the main floor is a lovely guest suite with full bath overlooking the lush landscape, and a laundry room with plentiful cabinetry, countertops, utility sink, built-in ironing board, clothes hanging rack, and large window bringing in natural light. 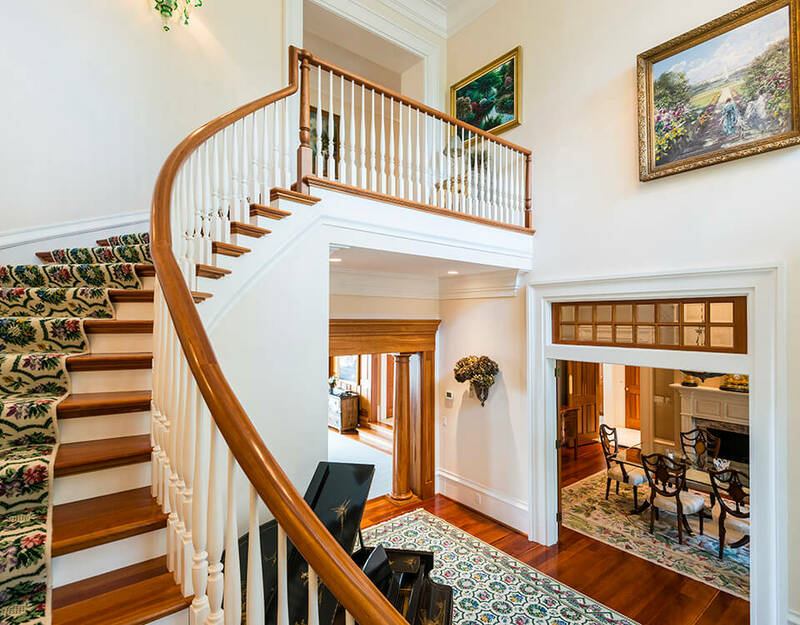 Take the hidden, winding staircase to the side of the home or the wood-paneled elevator with phone to the second floor, where a long gallery with a striking cove ceiling and custom-made carpet runner leads to the master suite and three large guest suites. The spacious master bedroom with sitting area streams with sunlight through floor-to-ceiling windows below a tall tray ceiling. 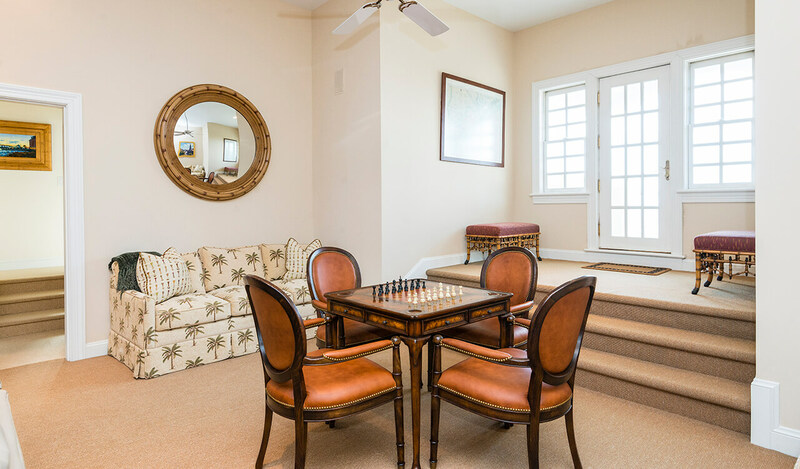 The elegant carpeted floor is soft and ultra-padded underfoot, and there’s a private coffee bar with a beverage fridge and sink. 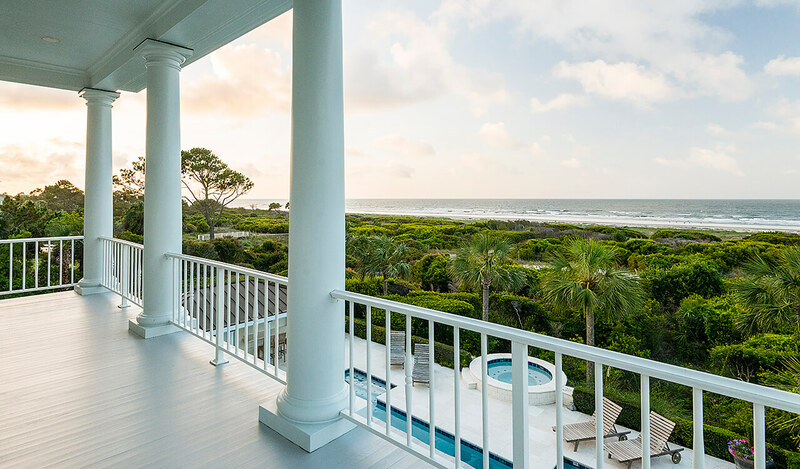 A glass door leads to the second-story covered porch with balustrade railings and beadboard ceiling, ideal for stargazing and taking in breathtaking views of the ocean, sea breezes, and the sound of the surf. 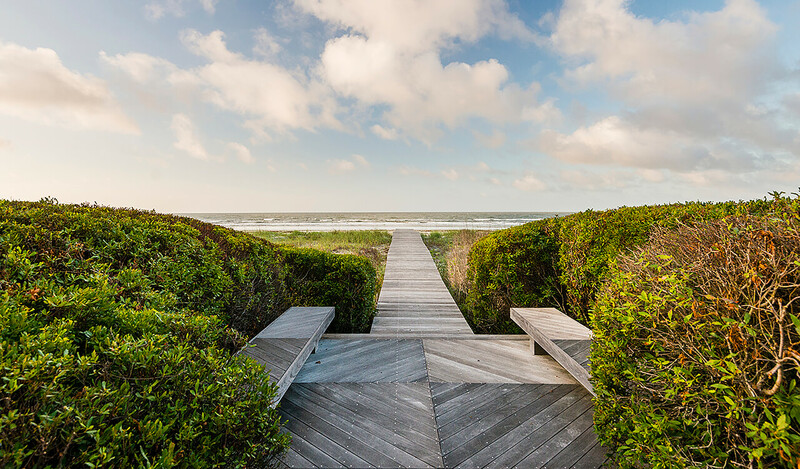 An exterior spiral staircase leads down to the pool deck for easy access to the beach. 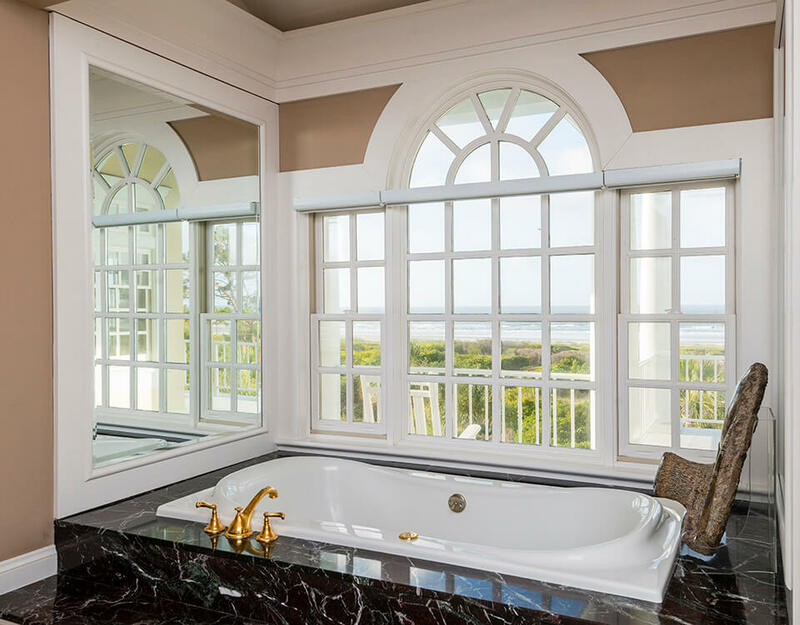 The master bath offers a private bidet and water closet, his-and-her vanities with marble countertops, a makeup vanity, a windowed walk-in shower with dual showerheads, and a deep jetted tub overlooking the sea. There’s also a cedar closet, walls of white built-in cabinetry, and two walk-in closets with custom shelving offering storage in spades. 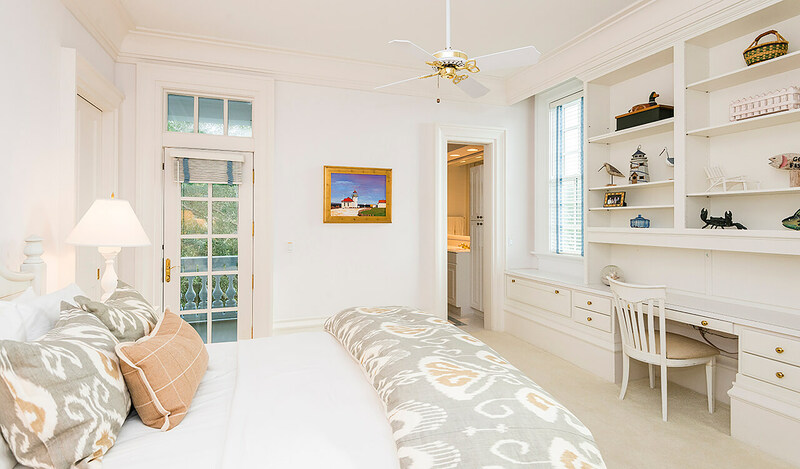 The second floor’s three guest suites each offer large windows streaming with sunlight, full baths, and custom built-in cabinetry. 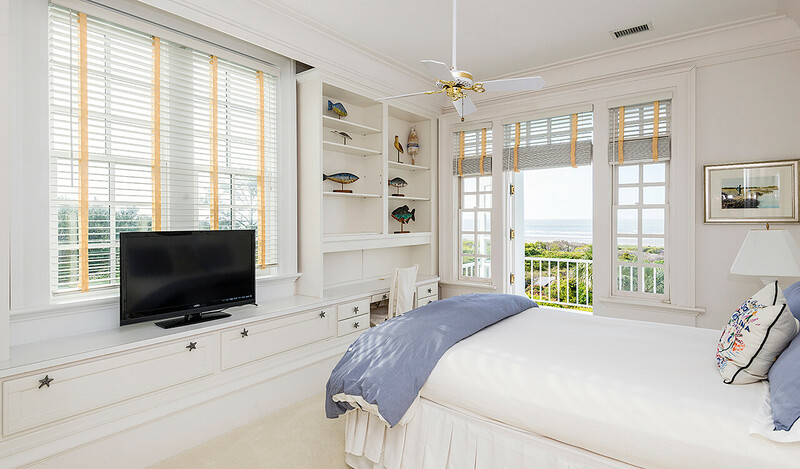 The western front suite includes two queen beds and shares access to the front second-floor porch with the eastern front suite; the eastern rear suite grants access to a semi-private second-level balcony. 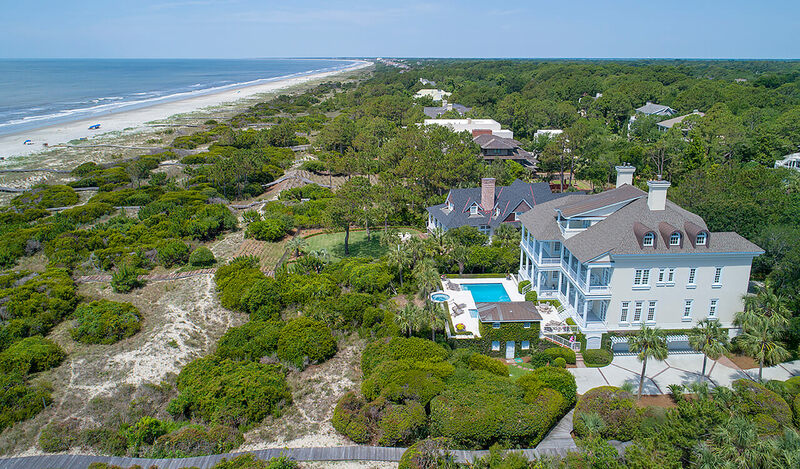 On the third floor, a generously sized media and game room features a billiard table, custom eyebrow window, access to an oceanside balcony, and custom built-in media center and cabinetry with refrigerator drawers. 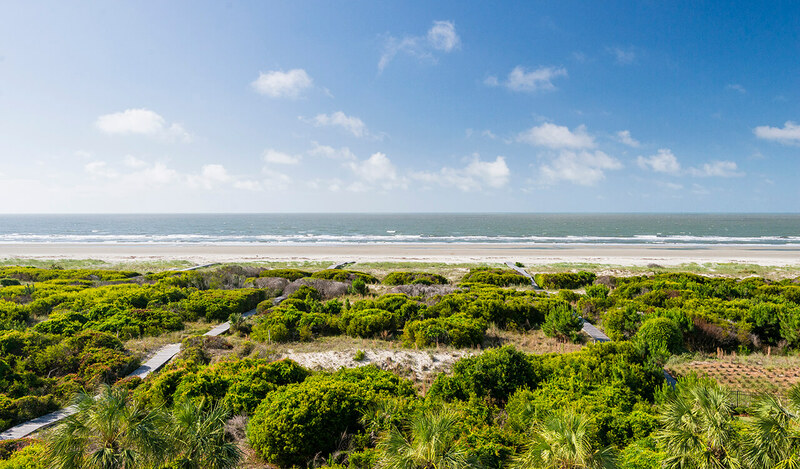 There are two guest bedrooms, two full baths with walk-in showers, and three large storage closets. Offered fully furnished, recent updates to this gorgeous home in the coveted neighborhood of Osprey Beach include a new stucco exterior with new waterproof membrane and flashing, new roof, new circular drive and garage entry driveway, new high-impact Marvin® windows on the eastern and western exteriors, new shell stone pool decking, and a resurfacing of the pool. The garage, with two sets of double garage doors and 800 square feet, can accommodate up to eight vehicles and includes a climate-controlled, paneled fitness room with window, recessed lighting, and fitness equipment as well as four outdoor compressors, two with exhaust systems. The rear stairwell and garage stairwell have in-wall foot lighting. 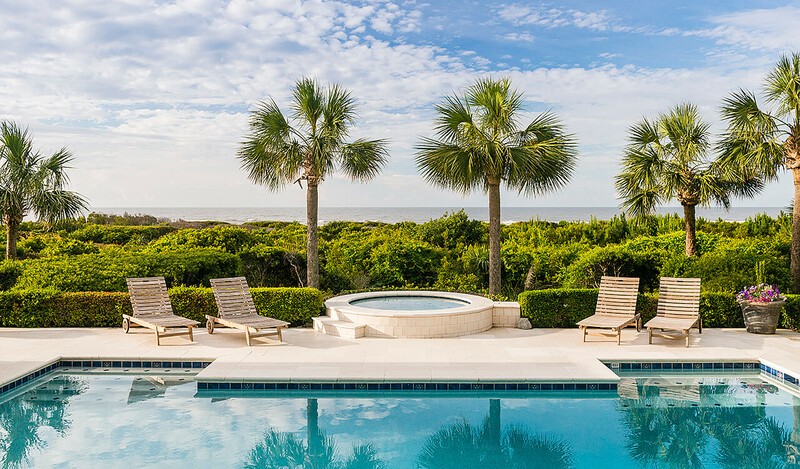 The copper-roofed poolside cabana offers a bar, kitchenette with a full refrigerator and sink, private bath with walk-in shower, and outdoor speaker system. There is also a gas hookup for an outdoor grill. 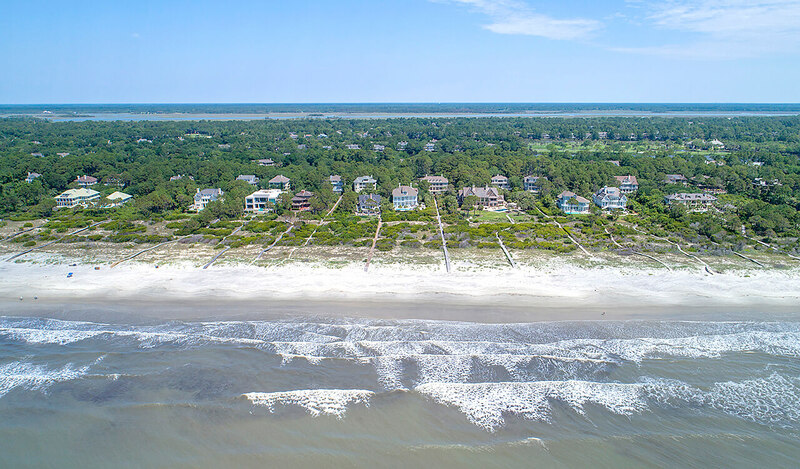 Additional features include selective landscape lighting, an irrigation system, planter boxes on the front porch with dripline irrigation, a four-zone HVAC system with programmable thermostats, and a security system. 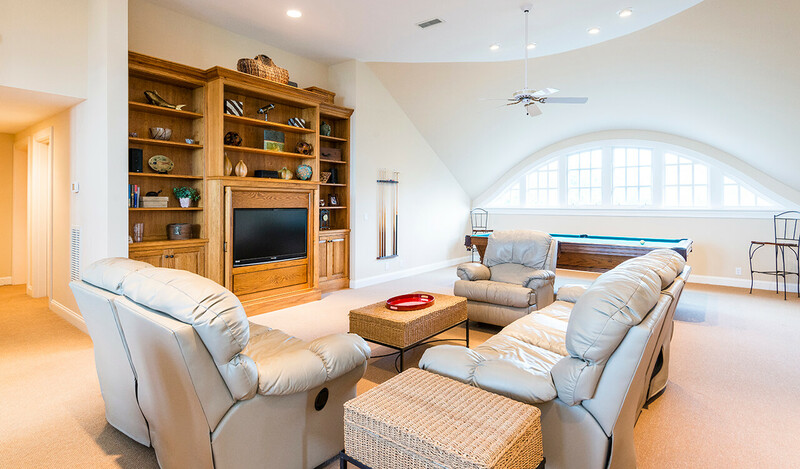 A sound system extends from the home’s main floor to the master bedroom, game room, veranda, and cabana. Inside, there’s a central vacuum system, automatic lighting in the closets, and closed-cell attic insulation.